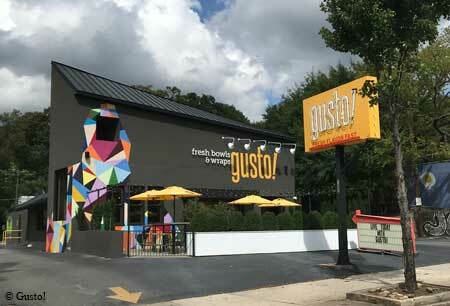 Exploring the flavors of a variety of cuisines, Gusto! seeks to make fast food healthy. : From Hazlehurst in South Georgia, Nate Hybl was a college and professional quarterback. Playing around in his kitchen with flavors he encountered as he traveled around the globe, Hybl assembled a concept that melded these new (to him) tastes and launched a fast casual restaurant that now has two Atlanta locations. The interior offers a soothing neutral palette with punches of bright yellow on the seating and outdoors on the patio umbrellas. Meanwhile, the ordering process involves choosing a base of salad, rice (or half and half) or a wrap and then picking either chicken, portobello mushrooms or wild-caught shrimp. Finally, choose a topping. These may include tahini-cucumber-feta that might be particularly good on chicken but less so on the shrimp; we chose the latter and dressed it in a tangy but mild apple-curry-peanut topping. The abundant shrimp were singularly good and not overcooked. Details include crisp house-made sweet potato chips that accompany every order. For dessert, get one of the two frozen yogurts, such as salted caramel. Beer and wine are available, as are fruit juices, tea and specialty sodas. Also located in Buckhead at 1935 Peachtree Rd. NE, 404-352-4157.